Amazon has posted a video demo for its new eReader, the Kindle. This has real potential. First of all, the device itself doesn't look like hell. The early shots of the prototype looked... clunky. The one in the video, and in the Amazon store , though, seems OK. Some of the buttons and the keyboard still look a bit odd compared to standard UI stuff... but maybe (benefit of the doubt alert) its related to power savings, hardiness of the unit, whatever. It looks a bit geeky, but, then again, it is. Free wireless hook-up. Yup. Amazon is eating the cost of cellular-network delivery (not Wi-Fi). So you just turn the thing on, connect to the Kindle store (and various other Web related destinations), browse for books, magazines, newspapers, etc. and buy 'em. Email personal docs to the reader (MS Word, etc.)... for 10-cents per doc (I think). 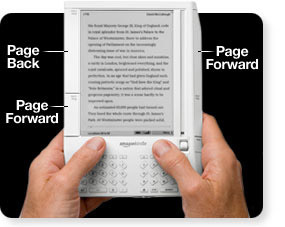 I already wrote about how I've been reading eBooks on my Palm/PocketPC for years. And so, for me, it will probably be awhile until I get one of these things (ie, until it costs waaaay less than a mobile computer that I need anyway for work, wireless phone, wireless web, etc.). So, for now, this falls under "really cool luxury." My guess is that (like Apple with the iPhone), in time, when more publishers are on board, the Kindle will come down in price, subsidized by Amazonian subsidies based on usage. It is, however, the first dedicated eBook reader I'd put on my Christmas list.